Highwood, IL has all your design and building landscaping needs covered with Medina and Sons. With our landscaping designing and building services, we are able to help you fully transform your property in the beautifully designed property that you have always dreamed about having. Having a properly maintained property has always been a proven way to help increasing the overall attractiveness and value of your home or business. Whether you are looking to implement a single flower bed or completely renovate your entire property, trust us at Medina and Sons to utilize the latest technology and equipment to meet your landscaping needs. 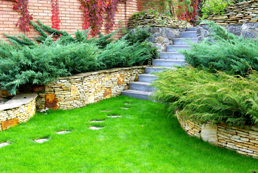 For more information on landscaping and design services, contact us today and we will be more than happy assist you with any questions or concerns.